But it has been colder lately. What good dog owners you are! I have to admit, I was a doubter at the beginning of Nunu's Advent Calendar, but she really does chew on a remarkable amount of things! Now I don't feel bad. We had the puppy over for a pre-adopt visit.. he had his heating pad, three pillows, three blankies..and he isn't even weened enough to come to our house yet. Yeah. I get it Nunu, I get it. I predict another stuff she likes to chew coming up soon. The question is, is that a heated pad specifically made for dogs, akin to a doggie snuggie? Aww. I tried to get one of those for my old cat in the winter, but he preferred his human heating units. Haha! I've been wanting to get one of those for my dog. Although I like to think that he loves me so much he sleeps on top of me... I'm tempted to think he's just a heat seeker. I need to get one of these for my cat! Is it a special heating pad for animals, or just a normal heated blanket? And she's not even chewing it! Dogs should be spoiled but I hope that is not another of the things she will chew on. Our chihuahua is spoiled too. 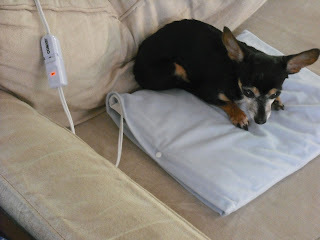 we have a microwaveable heating pad (rice bag) just for her.. Indiana weather can be brutal!! Nunu is adorable!! And, to be fair, she doesn't exactly have a ton of fur to help her stay warm. Seriously, not sure which posts are better...Nunu being spoiled all the time or the video clips of Bethany and the RAT! That was great! Awwwww... hey I totally understand. I live on the mountain in Makakilo and in the winter here it gets down in the 50s (F, for those not in Hawaii-we don't have heaters or insulation in houses here, so inside gets quite cold). Not sure if you follow this kinda stuff but there's some cool paintings and such of you and the losties. Can't say I'm a very big fan of how they drew you but I am a fan of the Hurley VS the Mayo Jar. SO cute! I hope she doesn't chew on on the chord though. Glad I'm not the only one! I do the same for my elderly 15 year old cat (we live in Central NY brrrr). Oh Cute! We got our cat when we lived in Hawaii and then the first winter we lived in Kansas I got him a heating pad. Hi dear Jorge!!! I saw so much time your Nunu, on your pictures, but until now I don't know- who is that??? Boy or girl! Say me please! We were just at Walmart looking for a german shepherd sized heating pad the other day :) I think we'll have to settle on an electric blanket. careful with that cable Nunu!! It's obvious that Nunu is living the high life! That's all right. Up until my dog got into t e habit of peeing in her sleep(tmi!) she slept in the bed with me under the covers. I thought for a little while before posting this, but I can't help voicing concern about giving a pet an electric pad, especially as avid a chewer as Nunu. I know it's grim news, but please consider... best wishes to you, Beth, and little Nunu. Because I am always the last person to know about cool stuff, I just found out about your blog (after having been a Lost fan since it started). Nunu's photo brought a smile to my face after a tough last few weeks. Thank you for posting it.